I've been pumped up thinking about trying the La Cense meat that I got yesterday. La Cense is grass fed beef - no last minute bulking up with grain. I've not had natural beef since my Poppaw passed away. In case you're wondering . . . what's the difference? When all the cows eat the same thing, they all taste kind of the same. Think of the varieties of apples. All different. When cows eat different grasses, the flavors are all a little different. Even better, grass fed beef is leaner. The fat is lower. The calories are lower. Gotta love that. 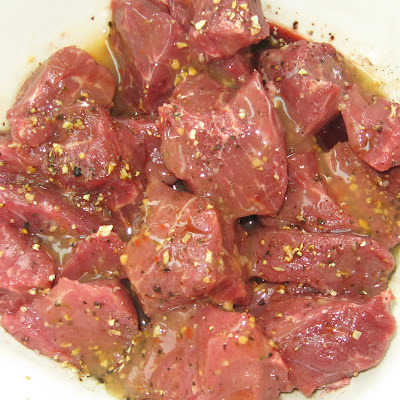 I decided to go with our favorite basic marinade, so I wouldn't add marinade flavors that might hide the meat flavor. First, I sprinkled on lemon pepper seasoning, then Worchestershire sauce (a few splashes, and finally Kraft Free Zesty Italian dressing (the oily type and not the creamy). For the vegetables, I went very basic - green peppers and onions. 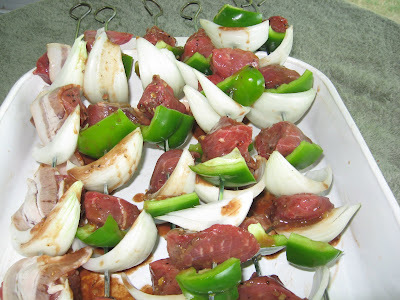 I basted a bit with Italian dressing as these kabobs grilled. With the lower fat in the beef, that helps keep the meat moist - but no added fat with the fat free version of the dressing. When I was done, I yelled for the boys. They gobbled these kabobs right down. If you have teen boys, you know what I mean. 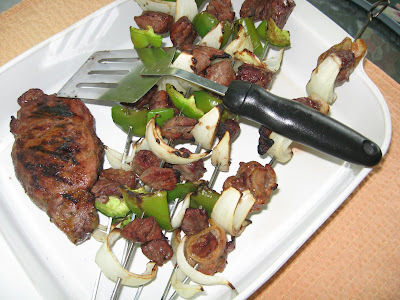 I was very impressed with the La Cense beef kabob meat. The flavor was great. The meat was very tender. Less fat. Thumbs up! This meal looks delicious. 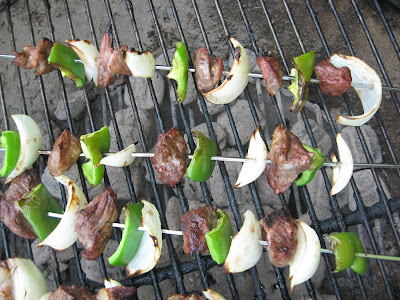 I love beef kabobs, especially if it uses grass fed beef. In my opinion it really does taste better-- and it is healthier as well. My brother recommended la censa to me a while back and I use them all the time. I will definitely have to try your recipe for them!